A hat tip to @NLInteligence for tweeting a link to a new OIE report announcing the detection of the H5N8 virus in a hunted Eurasian Wigeon – a dabbling duck - taken apparently early in October in the far north town of Belaya Gora in Sakha, Republic of Russia. When H5N8 turned up in both poultry and wild birds in Europe last month, it had traveled nearly 8,000 km from where it initially broke out in South Korea in January of this year, with no reports from the vast territory lying in between. 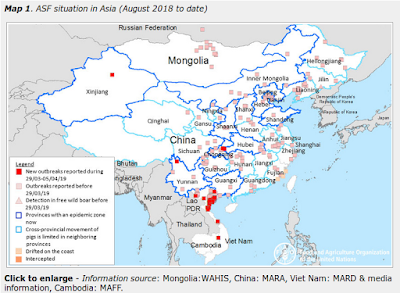 Reporting and surveillance in these regions is minimal, but today’s report adds at least one more dot on the map (3000 km north of South Korea) showing the spread of the H5N8 virus, and bolsters the theory that migratory birds are likely behind the spread of this avian virus westward into Europe. The following is a mash up of some of the details from today’s OIE REPORT.